I'm a stone mason, designer, and musician. Stone masonry is my perfect job. It combines my love for the outdoors and physical activity, design and architecture and it provides a constantly evolving creative outlet for my restless mind. 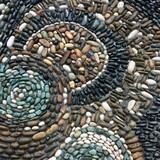 I love to learn new ways to use stone, and like music, working with stone can be a lifelong endeavor for discovery. As a Raleigh native, stone has always been present in my life. From my childhood visits to Historic Oakwood and Five Points neighborhoods with my family to touring Europe as a working musician, I was always intrigued by stone structures. Since starting Winding Path Custom Stone Masonry in 2001, stone has taken me on a challenging and creative journey. Stone has a timeless and classic feel yet lends itself to any style and I'm always willing to explore new ways to use stone. 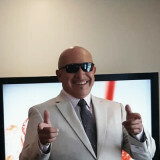 I always design and build using the style or technique that the project requires and I strive to meet a clients stylistic and practical needs. 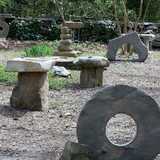 We have over 200 items such as benches, tables, birdbaths, lights, and garden art available at our studio. The best way to choose a piece is to experience them in person, so we encourage you to drop by and browse. Look for our "Open" sign by our driveway, or call us to schedule a visit. With over 25 years of hands-on experience in stone and masonry we pride ourselves on quality craftsmanship. We have completed hundreds of jobs on budget and on time. We continue to refine the installation process and procedure. Our professional staff can deliver estimates quickly, mange the job-site effectively and ensure that the work is done correctly the first time. Our personal 10-year guarantee on all of our work will ensure homeowners that they have a quality job. We currently employ seven skilled masonry crews that each specialize in a different fields of masonry; from custom stone work to highly efficient brick and block layers. We value our builder loyalty and work hard to exceed expectations on every job. We look forward to working together and building lasting relationships. Ken Conaway founded K & E Concrete with the goal of providing the highest quality concrete craftsmanship to his clients. With over 30 years of experience, Ken specializes in stamped concrete, which is the process of pouring slab concrete for virtually any area and adding patterns, textures, and pigmentation to the concrete before it is fully dry. 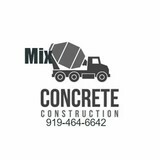 K & E Concrete is a family owned business operated by Ken and his two children, Kristopher Conaway and Elizabeth Clark, serving the Raleigh Durham area for almost 30 years. The craftsmen at K & E Concrete have years of experience, providing you with peace of mind when you choose K & E for your next concrete project. Founded in 1977, Brandco began as a small stone dealer with a 10-foot by 10-foot warehouse facility with no offices. As business steadily grew we eventually moved our facilities into a 2,500 square foot warehouse with four offices. Shortly after this move, Heatilator fireplaces were added to our product line along with marble, slate and mantels. In 1987, we moved into our current facility that includes a 12,000 square foot warehouse complete with four loading docks. Brandco offers a first rate showroom complete with 10 burning gas fireplaces and a 7,000 square foot outdoor display featuring stone and pavers. The showroom and outdoor display set the stage for home buyers to explore various upgrades and options. In total, we utilize 3 locations within Leesville Industrial Park; including a separate 10,000 sqft warehouse to manage our extensive Heritage Stone inventory. We have built our customer base on hard work and quality products. Builders have a choice and we work hard to keep their business. Natural Stone - veneer, flagstone, dimensional, counter tops. Manufactured Stone Veneer. Concrete pavers / walls. We are the only hardscaping company with multple locations on the east coast that focuses solely on hardscaping for outdoor areas. In fact, that is what our name, COVIS, stands for: Creating Outdoor Visions In Stone. This highly-specialized focus allows us to offer the absolute best in hardscaping and stone work. We will help create your outdoor visions and give you the outdoor living space you've been dreaming of! From installing new exterior columns to repairing your chimney, masonry contractors can help you add both visual appeal and value to your property. They’ll know what kind of installation makes the most sense for your Forest Hills, NC climate and regional style. Looking for something that will develop a patina with time? Or would you rather have your home feel brand new for years to come? Choosing the right kind of stone involves thinking about the future, too. Experienced brick suppliers and stone suppliers can help you find the material that will work for your home now and for years to come. These professionals aren’t limited to exterior work either. Whether you want a split-stone granite wall in the kitchen or need help installing traditional brick masonry on your fireplace facade, you’ll want a professional to get it right. If you’re already working with an architect or designer, he or she may be able to suggest a good Forest Hills, NC subcontractor to help out. Here are some related professionals and vendors to complement the work of stone, pavers & concrete: Landscape Architects & Landscape Designers, Architects & Building Designers, Garden & Landscape Supplies, Driveways & Paving, Siding & Exteriors. Find stone, paver and concrete professionals on Houzz. 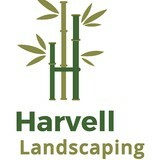 Search the Houzz Professionals section for Forest Hills, NC stone, paver and concrete professionals. Browse photos and read reviews, and contact a pro if you like their work.